PT Aetra's transmission pipe with 1,6 meter in diameter leaked in Pondok Kelapa, Duren Sawit, East Jakarta. The pure water pipe is suspected to leak because hit by drill of Bekasi, Cawang, Kampung Melayu, (Becakayu) Flyover Highway Project. "The drill hit transmission pipe and broke it "
As a result, the water supply was threatened to stop for around 300 thousand pure water customer in East and North Jakarta. The pipe is planted to the ground for 2,5-4 meter depth. 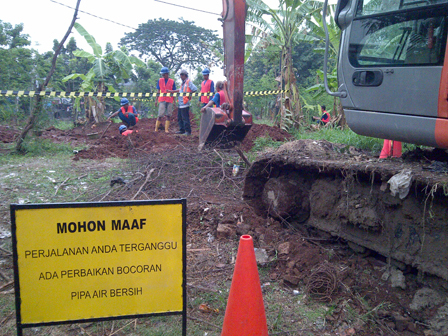 "The drill hit transmission pipe and broke it," said Hari Yudha Hutomo, PT Aetra Managing Director, Tuesday (11/25). Hutomo continued, his side immediately asked PT Waskita Karya as Becakayu toll project contractor to stop the process to avoid bigger effect. Because of this leakage, the water came out from the pipe by 5 liter per second. It could reach 3,500 liter per second if the project is not stopped.